It is called RoI. I am spending almost $500 per week in fuel on one truck. It wouldn't take long for me to get a return on my investment. I spent $52,000 over the last 2 years on fuel for just my one truck. If I can improve my mileage even 3-4mpg that is $2,000 a year savings on one truck. Now lets multiplie that times 4 trucks. That would give me an $8,000 per year raise. That is why I had to bring my crew into your backyard to do your work. How is a metal roof carpentry work? it says under his name he is a carpenter not a roofer or a gc. That would be the same as you saying you had to do the masons work putting on a metal roof. Doesn't make sense. Well, first you said $50 a day which is $350/wk, now it's $500/wk. At 11 MPG that 1375 miles a week. Which is 230 a day. Which means you are in your truck about 3 1/2 hours a day, 6 days a week. It's because I don't want to work on a BK roof, neither does anyone else in my town. Apparently someone from 3 1/2 hours away does, which is odd since there are numerous company's 20 minutes south that do that type of work. They must not want to work on BK's either. Around here more and more contractors have 2 different vehicles. A truck for work and a fuel efficient vehicle for the other driving they do. We also had to do some structure work. Since the framing was damaged. We did mostly flat roof on this project (Duro-Last). You are right though they are two different animals. No we just happen to work with a CM that handles franchises. We do most of his work through out the country. We go as far west as Texas and as far east as Baltimore. That is one route I am considering. It just seems when I don't have it that is when I need it. When I was a much larger company I had no need to drive a "work" truck. I drove a Suburban all the time. I had a full time runner, oh the good ole days. Here is a pic of the gas pig. I am finally getting it lettered this week. it only took me 2 years. I was wondering about that. I have asked several people that question and nobody gave me a good answer. I do have 4:10s and my last truck 3:73 I wonder if I change it out if that would make enough of a difference. This will get a 25% increase in mileage, but not for use when towing (at least the final drive option). Kind of spendy, 3k. I just stay at 68mph on the highway to keep my rpms where they need to be with my 4.10 axle ratio. Kind of a spendy deal changes both ends. With my dually it has 4.10s in it and had a road 5speed in it. , but it was hard to pull my big flatbed loaded . So changed out the transmission to a lower gear ratio, dropped 10 mph or about one gear. Pulls great now just lost my top end speed and a little mpg. 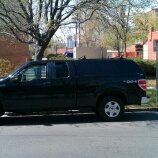 I am getting 16 avg with 80% city driving in my 2010 F150 5.4 with topper. My Chevy 1500 averages about 18/19. Low 20s on the highway, towing its more like 14. I was also going to say rear gear ratios make alot of difference. Sounds like you got a ton of built inns too, tool boxes ,batteries, inverters , ladder racks, compressors etc. is most of your driving city or highway,? I do a big mixture of both but I guess mile for mile it is mostly highway. If you broke it by time in the seat it is city driving. My tool box weights too much I know that. As for the extra battery and other electrical accessories they don't weight more then 100 lbs. the ladder rack does have some weight to it. Here is the kicker, before I put anything aftermarket on the truck it got 12mpg. I only lost one point adding the extra weight. I think it has do with the extra emissions and the larger gears. I doubt I will change the gearing. I am going to go through the intake and exhaust fairly well now that it is past the warranty. If it breaths better I think I can gain the 15-20% I am looking for. Keep us posted, people have often stated it helps, but never any numbers to back it up. I know a guy with a diesel, he made a hydrogen fuel cell bubbler thing he swears made a huge difference, he has no Speedo, so again no numbers to back it up. Is you're Trans a 4 or 6 speed, my half ton has the six, plus the 5.3 with 4/8cylinder deal. I cruise at 70 mph around 1500 on the tach. I notice in my Yukon, if I keep the tach under 2000, mileage is easily 15% better. It has the 6 speed and it does not have the 4/8 option. I think it is the only GM vehicle that will not run on E85 either. I have sent a few emails to some friends that build muscle cars asking them what they recommend. I am thinking K&N cold air kit and Flowmaster exhaust system. why dont you get a truck with a diesel?